A local 1950s RV park has turned into the largest tiny house community in the nation. When Orlando Lakefront owner Adam Money accepted his first tiny home resident in the summer of 2014 he had no idea he was about to become part of a movement. Located on the shore of Lake Fairview in College Park, this revitalized 49-lot RV park is now the largest full-time tiny house community in the country with 13 tiny homes nestled among the recreational vehicles. Due to zoning restrictions that prohibit dwellings under a certain number of square feet within city limits, tiny house owners often have a hard time finding a place to live in their home. Many choose to live off the grid, placing their house on undeveloped land and using solar panels and composting toilets for basic necessities. 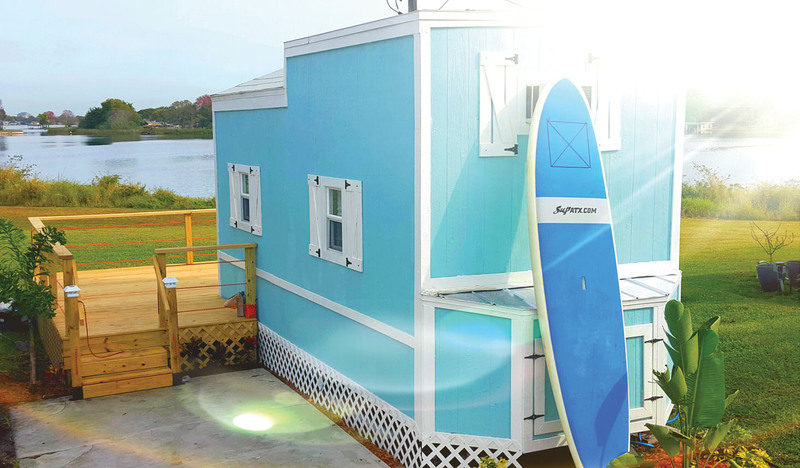 Orlando Lakefront provides tiny house owners with hook-ups for water, sewer and electric, eliminating the need to forgo amenities they were used to in a traditional home. The tiny properties that make up Orlando Lakefront range in size from 97 square feet to 398 square feet and vary in style, from modern to nostalgic. The community boasts a red train caboose, a converted U-Haul trailer, a sleek two-story design made with wood and metal, and a coal miner’s cabin. The majority of these micro dwellings are tiny houses on wheels, built on trailers so they can be moved if the owner is ready for a change of scenery. Orlando Lakefront brings together 80 residents as diverse as their homes: students, retirees, young professionals, small families and lots of pets. Neighbors bond over a sense of shared experience. Money receives more than 30 messages per week through the Orlando Lakefront Facebook page and blog, all from people interested in going tiny. Taylor is amazed by the fascination with their community. Orlando Lakefront welcomes those curious about tiny living to experience it first-hand. For those interested in a tiny overnight stay, several of the homes are now available for rent on Airbnb.com. Orlando Lakefront also serves an incubator of sorts, with two tiny homes that are built on foundations available for rent to those who want to try living tiny on for size. If the renter falls in love with the unique lifestyle a small space affords, Money will even help connect them with a tiny house builder. And where better to park their future tiny home than the Orlando Lakefront.